Subscribe to the Audio Podcast version here! People have been smuggling goods (bullet bill guns, poison mushrooms, fireflowers, etc) into the city past our security somehow. So far it's nothing major, but I need you to look into it anyway. I've got a tip from one of my sources in the 3rd Ward, Konti Tom, that a drop is scheduled to happen within the next week. He wasn't sure when or where. I need you to find the drop point and ideally arrest the men in charge of sales. Lethal force is NOT authorised. I know it's a bit outside your normal range, but most of our other patrols are dealing with a series of more major threats elsewhere in the citadel and you are scheduled to patrol 3rd Ward for the next week or two anyway. 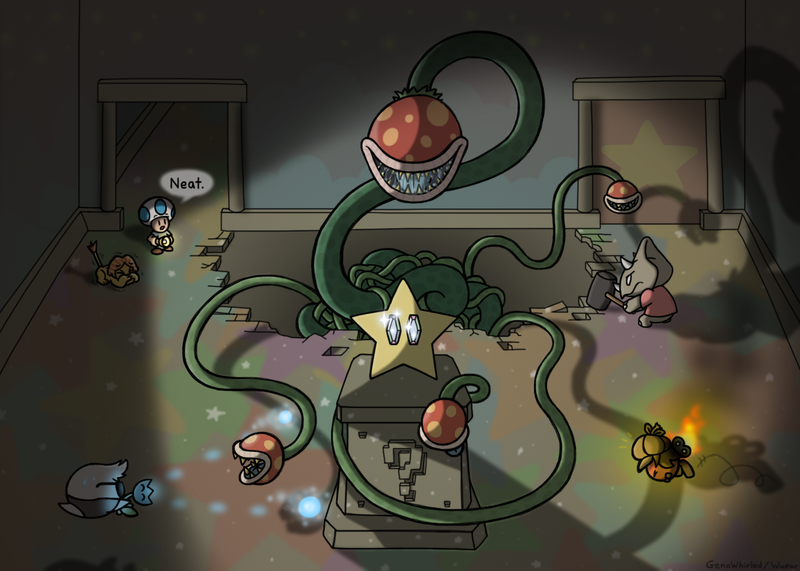 Basically, this is SUPER AU-Mario. There's all the places from Super Mario RPG, SMB3, SMW, Yoshi's Island, ASMT, ASMBXT, A2XT, etc. It takes place shortly after SMB3 - when the Koopa Kingdom successfully invaded the Mushroom Kingdom and set up puppet governments in the various states, including a new central Koopa government, and then promptly lost them to Mario, being pushed back to their own territories. It is during the events of ASMT, so King Charles the Fourth has not yet been overthrown. Last edited by The Destroyer of Worlds on 09 Aug 2015, 19:38, edited 73 times in total. To summarise the hints I've dropped before - it's Mario related, raocow and I will be playing together, it's tangentially related to ASMT, and it's a Mario-themed Hack of a game. Last edited by Heraga on 23 Feb 2015, 21:07, edited 1 time in total. Ningamer wrote: A Raocow Thing. Considering the sheer length of this video, are we still going to have SMJ today? Is it even a video? I skipped a bit and saw the same static screen of the 3D 8-Bit SMB2 picture. Grounder wrote: Considering the sheer length of this video, are we still going to have SMJ today? This isn't replacing anything, it's a C-side. We did a whole huge 4-hour-long session on Saturday, and we'll be trying to do that every week. I'm cutting it up into 30-60 minute episodes (and clipping out bits here and there to make it easier to follow). I think it's up to raocow and Horikawa whether they want to release 1 episode a week to build up a backlog, or upload them all by the time we do the next session. even though the thread says weekly, it's probably going to be two videos a week. And no it doesn't replace anything. Well, that was unexpected. I found it pretty amusing, though. Oh wow, I wish I could have been a part of this. Irony, thy name is Talkhaus. That's Horikawa who's so much quieter than everyone else (after her post-commentary intro). She's the one who recorded, but something was wrong with her audio setup. About halfway through the session there was a technical difficulty, and after that we should all be closer to the same volume. So things should be better at the start of Episode 3. I've seen some people play tabletop games on youtube, so this was not a completely new experience to me. I think these are always pretty entertaining once the story gets going. Yeah sorry I turned on this 'dynamic equalizer' thing and it ruined everything. But I've just turned it off now and so we'll be good in the future. So, essentially a raocow DnD podcast? I'm down.